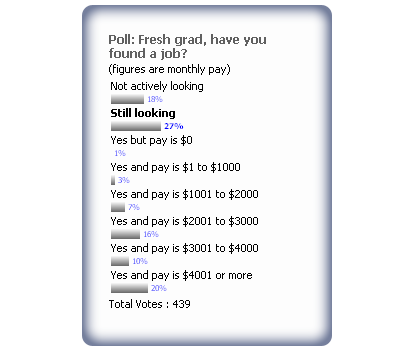 In the graduate employment survey conducted by Salary.sg, 45% of the respondents indicated that they are without jobs. In this jobless group, 60% are actively looking for a job, while the remaining are not. The poll was conducted over about 10 days with a better-than-expected 439 responses. As for the 55% (or so) with jobs, the median income is between $2,001 and $3,000. Not too bad. Contrast our survey results with those (overly) positive-looking ones from the 3 local universities. Note: Figures do not add up to 100% due to rounding. it's true. i'm watching the tv show on 8 now, also talking about jobless grads. tragic. wa got 20% of fresh graduates with more than $4000 in these times. It's quite true that many recent graduates whom I know personally are without jobs. Many have sent out tons of resumes but only a few got interviews. Only the luckiest ones have jobs. Does anyone here have similar experience? What's the feeling on the ground? Seems to me stock & property prices and the Great Singapore Sale do not give the correct picture of the gloomy situation on the ground. Sadly, there are still many grads still intensively looking for jobs. Many have given up on joining the private sector (MNCs) and have decided to start off in government agencies or even be teachers until the job market recovers. Half my friends are jobless.